Kingston White China Vessel Bathroom Sink with Overflow Hole & Faucet Hole EV4337: This White Vessel Bathroom Sink w Faucet Hole is built to last. The highest quality standards are used to precision manufacturer a top of the line product. Important features of this BRAND NEW Fixture: Complete Item! Everything necessary for installation is included. 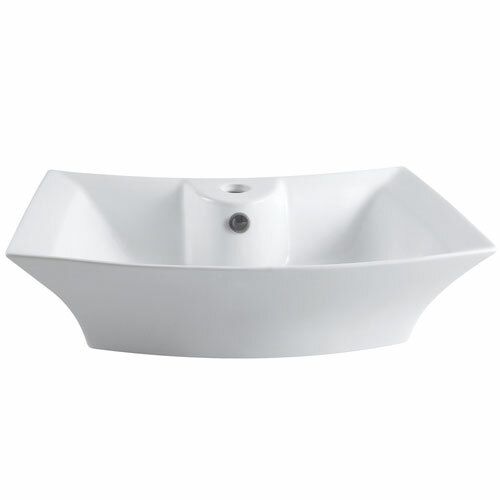 Matching Accessories Available - Easy to Install - Installation instructions included - White China Vessel Bathroom Sink with Overflow Hole & Faucet Hole - The square-shaped basin of the Courtyard vessel sink is defined by its sharp, skewed curves and skewed outlines made from strong vitreous china. The outer basin complements the curved design of the inner basin giving a distinctive look to your bathroom. A single-hole drilling is mounted on the small faucet deck with a overflow hole drilled in the front for drainage. - Finest vitreous china vessel with high chemical and thermal shock resistance - Stain resistant and easy-to-clean - All side enamel finish - Closed plumbing from rear end - Drain not included - White premier finish designed to resist fading and tarnishing. This fixture is manufactured by Kingston Brass and is part of their Sonata collection. The square-shaped basin of the Courtyard vessel sink is defined by its sharp, skewed curves and skewed outlines made from strong vitreous china. The outer basin complements the curved design of the inner basin giving a distinctive look to your bathroom. A single-hole drilling is mounted on the small faucet deck with a overflow hole drilled in the front for drainage.